Pros: Snappy when an SSD is used. Has HDMI and VGA out. Other Thoughts: A good value. Pros: Runs XenServer 6.5 out of the box, and can run 2 or 3 server vms with no problems. Very fast for a Celeron. No complaints at all! Other Thoughts: This is a great little board. I purchased one for my father to replace an aging laptop turned desktop. This little board has done an excellent job paired with an ssd for his web/office needs. It is running fan less and has been fine. I tried raspberri pi2 and banana pro to make low power servers but neither could handle the network throughput I needed. The pi has 10/100 and the banana's cpu couldn't handle samba and 1000. I reviewed hundreds of mini-itx boards and in the end settled back on the one I picked up for my father. I landed with this board and a seagate nas 3tb drive with 4gb memory. The system consumes about 22watts idle with the disk spinning. The power supply consumed about 10 by itself. I never pushed it over 30 in my tests under load. It has been running debian as a home server for 3 months without pause. I reliably max out the gigabit port in my desktop when transferring files via samba shares to it. The CPU has plenty left over to do other things at the same time. I wanted low power with virtualization capabilites so that I could run KVM or other hypervisors. I needed usb3 to use for backing up to external usb3 drive. As I mentioned the one major con is the documentation was poorly written on the memory specs. It lists: DDR3 1333/1066 which I assumed meant you could use 1333 or 1066 memory. What it means is 1333 (PC3 10660). 1066 does NOT work. 1333 (PC3 10660) works perfectly. As I was troubleshooting if I received bad memory etc., I over used the memory socket and broke one of the eject tabs. The hold down part still works but when you open the clamp, you have to pull the chip up on that side. I concluded I could live with that and kept the board. I plan to install KVM soon and start running small VM's for various abstraction, testing and sandboxing. I have seen others mention difficulty with headless and or linux. I have had 0 trouble with headless or debian. I can't say for other distros. I also have only used usb keyboard/mice so perhaps ps2 has a problem. 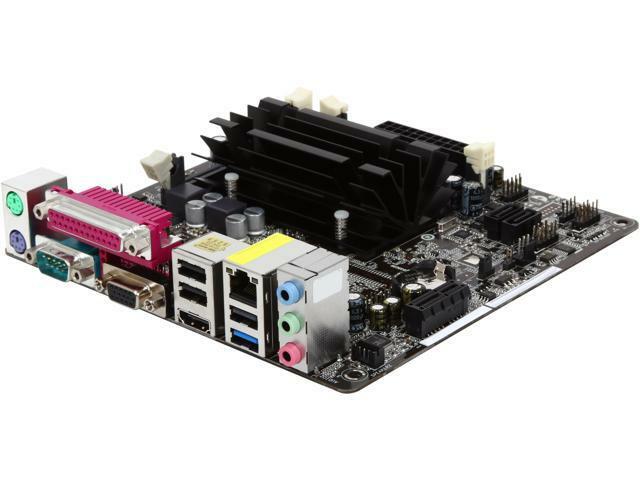 Other Thoughts: I use this board/cpu for a home server that runs dedicated games, media (plex), and a file server. Able to handle all with ease. I even run an ARK dedicated server on this! Pros: On paper this looked to be a great match for a project server based on CentOS Linux. When tested with non-CentOS operating systems, it appeared to be what we had hoped it would be with CentOS. Cons: Could never get it to fully install CentOS. USB failed. Tried with PS/2 keyboard and mouse and SATA DVD - failed. Tried again with USB turned off in UEFI per some user forum posts, but it would fail every time. Other Thoughts: It did work with Linux Mint Debian Edition and Windows, but our project required we use CentOS or Red Hat - so this was not the right motherboard for this project. Posting this review to warn any other potential CentOS / Red Hat users that they should look elsewhere. This motherboard will not work for them. Pros: For the money, this is a nice little board for a system that you need for basic tasks. I run win7 32 bit on this system no problem. I will be using this pc for CNC control via the parallel port. Youtube and netflix also work fine with the onboard video. Cons: USB works right up until the time I load Linux. Then the mouse light goes out and stays out. This motherboard must work okay with WIndows but there seem to be a lot of complaints about its compatibility with LInux. I couldn't get any USB devices to work with either Debian (LinuxCNC) or Ubuntu. Updating the BIOS to 1.60 didn't help. Other Thoughts: I bought this motherboard to act as a CNC controller. Key capabilities were fanless operation and a parallel port. The inability to get USB to work means I can't use USB wireless to control it. Unfortunately, mainboard does not provide Linux base OS drivers, which depends on chipset developer. Please check if the using Linux OS has built-in driver for the mainboard or 3rd party website. If you have any technical issues please contact us at http://www.ASRock.com/support/tsd.asp. We will assist you shortly.